The fight to make your Morinville home more energy-efficient is far-reaching. Not only will a more energy-efficient home save you a lot of money on electricity and gas costs over time, but it will also reduce demand for resources, making your home more environmentally friendly. When you think about how to make your home more energy-efficient, you may first think about things like changing out your light bulbs or getting Energy Star appliances. While these are good changes to make, you should think much bigger, including exterior elements like windows and doors. Most traditional windows are single-pane. That means that only a thin piece of glass stands between your home and the outside world, and glass is not a very good insulator. Hot and cold air will easily pass through the glass, making your HVAC system work harder to heat or cool your home and sending your energy bills soaring. Vinyl windows have double and triple panes of glass, and the panes are further insulated by a layer of inert gas or air. The windows serve as additional insulation for your home, helping to maintain more consistent temperatures and taking the strain off your HVAC system. Aluminum windows can rust, create holes for air to pass through your home. Wood windows can rot or warp after exposure to water, pests or extreme temperatures, again creating opportunities for air to escape or enter your home. Vinyl windows have frames that do not warp, rot or rust. The frames are resistant to water and pests, so they will not shift and create space for air to pass. 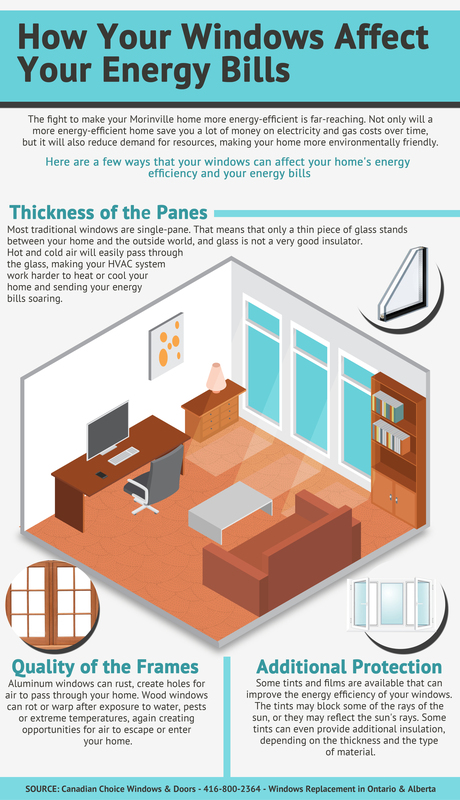 Some tints and films are available that can improve the energy efficiency of your windows. The tints may block some of the rays of the sun, or they may reflect the sun's rays. Some tints can even provide additional insulation, depending on the thickness and the type of material. Check out window companies in Morinville to find great deals on vinyl windows and make your home more energy-efficient. Not only will you save money on your energy bills, but you will be doing your part for the environment and creating a beautiful, new look for your home.